During the past year we discovered lots of amazing new green products for babies and kids. The main overarching trend? Products that are convertible, double duty, and dual purpose so they’ll last longer and do more for you. 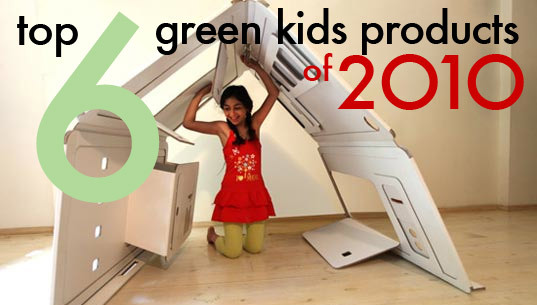 Other top green products of 2010 were ingenious displays of modern design built for play. See the most popular green design products for kids and babies after the jump including a doll house we wish was big enough for us to live in and a brilliant tree-shaped bookshelf. Vote for your favorite! Love love lovin' the pop-up playroom. one of those projects that becomes so fun for adults as well! During the past year we discovered lots of amazing new green products for babies and kids. The main overarching trend? Products that are convertible, double duty, and dual purpose so they'll last longer and do more for you. Other top green products of 2010 were ingenious displays of modern design built for play. See the most popular green design products for kids and babies after the jump including a doll house we wish was big enough for us to live in and a brilliant tree-shaped bookshelf. Vote for your favorite!